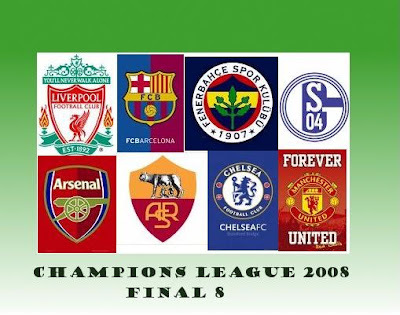 Now that the first knockout round is finished, allowing Arsenal FC, Fenerbahçe SK, Manchester United FC, Liverpool FC, FC Schalke, AS Roma, FC Barcelona to compete for the quarter finals. But what team will get it? I mean, get through the finals and be crowned champions? Knowing that 4 of the English League's most dominant teams are in, Manchester United FC, Arsenal FC, Chelsea FC and Liverpool FC. But, anything could happen and any team could grab the title. Quarter finals will be on April 1-2, 2008. Just can't wait anymore for the next rounds.